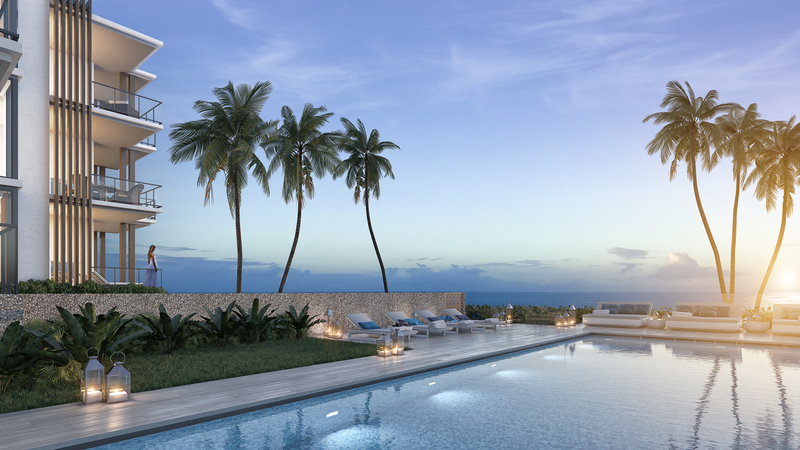 The ultra-luxurious condo is the first new oceanfront residence in Delray Beach in more than 30 years. Terraces larger than many small homes (662 to over 1,500 square feet). A private enclosed and air-conditioned garage with an electric car charging unit. A climate-controlled golf cart parking facility. A private elevator to take you from your individual garage to your home. Developer says project will set new area standards. It’s also the first oceanfront residential development in Delray Beach in more than 30 years. It’s a project by NRIA and US Construction called Ocean Delray, which will replace Wright by the Sea set to be demolished next year. Completion of the 19-unit condo is set for the fourth quarter of 2020. The three-story condo on a 1.8-acre parcel was designed by well-known South Florida architect Randall Stofft who designed the Seagate Hotel & Residences. He was “given carte blanche to pursue his vision for the architecture and interior design of Ocean Delray,” says a news release. The residences will be named after famed artists like DaVinci, Michelangelo, and Van Gogh. They will range from 3,300 square feet to more than 4,600 a/c square feet. Prices will be upwards of $4 million but early interest appeared to be strong. A pre-launch party in early December attracted dozens of brokers and prospective buyers—including several who have already reserved. Wright by the Sea sells for $25 million. Wright by the Sea sold for $25 million. New Jersey-based National Realty Investment Advisors LLC reportedly received a $22 million mortgage from affiliates of New York-based Ares Commercial Real Estate management. The last oceanfront condo built in Delray Beach was in 1974. Limited available land and zoning restrictions prevented building. These same factors are affecting land along the Intracoastal in Delray. The last newly constructed building, Seagate Residences, was located across from the beach, and it was built in 2007. The Wright by the Sea motel was built in 1953 and was under the same ownership for over 40 years.